This picture was probably taken in the early 1930's, showing waiters setting up for a rather large event in the indoor tennis court at Harold I. Pratt's 'Welwyn' estate in Glen Cove. 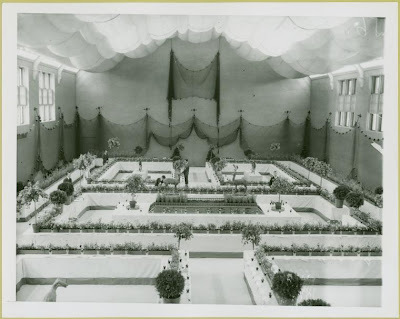 Courtesy of Bruce A., the NY Times wrote on April 12, 1931 that Mrs. Harold I. Pratt, a vice president of the Garden Club of America, was planning a dinner on May 19th of that year for the women of the Garden Club of America that was to take place in the indoor tennis court. There is a very good chance that the picture above was indeed this particular event. Fantastic picture- like a scene from a movie! It really is telling of the period and the lifestyle. I looked at all the pictures you’ve posted on ‘Welwyn’; I like what D&A did to it- what a stylish looking place. It looks like some sort of ladies' garden luncheon. Perhaps? I wish we knew more! Interesting...before the murals were painted? Are they still visible in the ruin today?